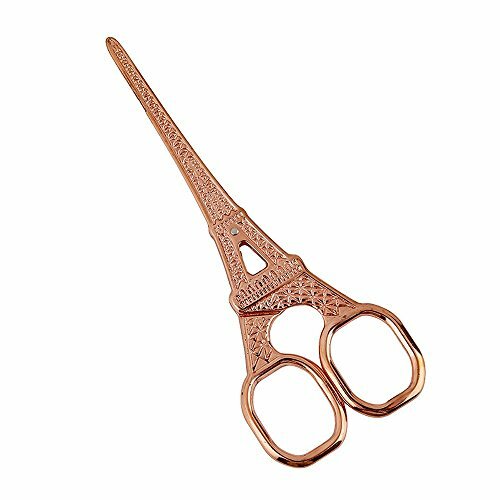 Eiffel Tower Embroidery Scissors 5.51-inch Small Sewing Scissors Retro Style Craft Scissors for Art Needle Work -Rose Gold by Arolly at Transparent University. MPN: AFSC-RG. Hurry! Limited time offer. Offer valid only while supplies last. Material: made of premium stainless steel and resist corrosion, rust and stain. Using it for a long time. Comfortable and Elegant Eiffel tower design: the embroidery scissors are right size and comfortable to use. Effective: having pointed edge and sharp blades, can save time to finish your work. Perfect for cutting thread and paper items, but not for heavy yarn or hard fabric. Multi-purpose: suitable for embroidery, needlework, crewel, sewing, crafting and other .ideal gift for kids ,dressmaker, or craftsman who like sewing or DIY. Smart Size:5.51 Inch the small scissors are great for carry-on. If you have any questions about this product by Arolly, contact us by completing and submitting the form below. If you are looking for a specif part number, please include it with your message.